A dividend option where the policy dividend is paid to the policy owner in cash. An insurance policy that no longer requires premium payments to. For investment bonds, the par value or face amount is the amount due at maturity and is the amount on that interest is calculated. For common stocks the par value is an arbitrary dollar value assigned to each share. A medical "check up" of a proposed insured for a life or health insurance policy done as part of the underwriting process. The examination is conducted by a medical professional, selected by the insurance company. The examiner is not a physician. A condition that results from an illness or injury that prevents a person insured under a disability income policy from performing one or more of their principal job duties or is unable to work the same amount of time as before the disability occurred. An insurance policy that pays a dividend to the policy owner. Generally this type of policy is issued by a mutual insurance company. A type of preferred stock that pays a stipulated dividend and also allows the holder to receive additional dividend distributions under specified conditions. A form of business ownership with two or more owners or partners who form an agreement to pool their funds and management talents and share in the profits or losses of the business entity. General partners are responsible for the day-to-day operations of the business and are personally liable for the partnership's liabilities. Limited partners invest capital in the business and are not involved in management decisions. The federal government organization that insures the benefits in qualified defined benefit pension plans. The PBGC was established by Title IV of the Employee Retirement Income Security Act (ERISA) in 1974. Also see PBGC Home Page. A beneficiary designation that pays the insurance proceeds to the living heirs. Also see per stirpes. See cash value life insurance. Exposure of a person or property to injury or loss. A review of an insurance applicant's life and health record, financial standing, vocation, personal character and habits and driving record. These characteristics are taken into consideration during the underwriting process and risk classification of one applying for insurance. A beneficiary designation that pays the deceased beneficiary's share of the insurance proceeds to the descendants of the deceased beneficiary. Also see per capita. A measurement of the degree to that policies stay active or inforce. A general agent that is contracted with one or more insurance companies and spends the majority of their time selling insurance. PPGAs are generally appointed with a carrier by a MGA. A form of health insurance also referred to as open-ended managed care that permits the insured to select providers outside the plan. The costs that are incurred by the insurance company in the production of new business. These costs include the cost of underwriting, issuing and paying first-year commissions. The anniversary of the issue date of a policy. A flat charge, generally included in the premium, made by the insurance company to cover the administrative expenses of a policy. A nonforfeiture provision in cash value life insurance policies where the policy owner may borrow from the cash value of the policy. The interest rate that is charged on such a loan is usually significantly lower then borrowing from a bank. Because this loan cannot be turned down by the insurance company, it may be wise to use this type of loan for conditions where other sources of borrowing are no longer available or too costly. If the insured dies before the loan is repaid, the loan plus any interest will be deducted from the death benefit. The person who has the right to make changes to the policy. The policy owner may or may not be the person covered by the insurance policy. A policy provision that may be included in survivorship life insurance policy that provides for the splitting of the policy into separate policies in the event of divorce of the insureds or changes in the estate tax laws that would adversely affect the policy. Evidence of insurability may be required. A collection of investments either of an individual or an institutional investor. An investment professional that is responsible for managing a portfolio in accordance with the portfolio's investment objectives and policies. A child that is born after the death of its father. A written instrument that empowers an individual to act on the behalf of another individual. The scope of the attorney's power may vary from being very specific ("only to execute a specific contract for me") to being virtually unlimited ("to do anything I am legally able to do"). See personal producing general agent. The process where an insurance company is authorized by the policy owner to automatically deduct from the policy owner's checking account the amount of the insurance premiums. Generally the premiums are paid on a monthly basis. A medical, physical or mental condition that existed or was treated before the policy was issued. A form of managed care health insurance where a group of physicians and hospitals are contracted to provide comprehensive health care services, at discounted fees, for the individual members of the organization. A specific underwriting risk class assigned to an applicant for insurance with a greater life expectancy/lower probability of incurring a loss than standard or higher risk individuals. The amount of money paid to the insurance company in return for insurance protection. Typically, a premium is payable once a year for the next year's insurance coverage. Other modes of payment may include monthly, quarterly, semiannual or a single premium payment. A policy provision that allows a policy loan to be used to pay the premiums. Also know as Automatic Premium Loan (APL). The amount of money that would need to be invested today at a given interest rate (present value of a stream of future payments) to equal a predetermined sum at a future date. The amount of money that would need to be invested today at a given interest rate (present value of a future payment) to equal a certain sum at a future date. This is a provision contained in many disability income policies that provides for benefits to be paid for life, under certain conditions, (e.g., loss of sight, loss of the use of both hands, etc.) with no future proof of disability, even if the insured returns to work. A financial ratio that relates a company's stock (share price) to its total assets less any intangible assets (goodwill, patents) minus current and long-term liabilities. A financial ratio that is commonly referred to as the P/E ratio or multiple. This is the relationship of a company's stock price divided by earnings per share. It provides investors with an indication of how much is being paid (share price) for a company's earnings potential. The first beneficiary named to receive the proceeds of the life insurance policy. The primary beneficiary must be alive at the death of the insured in order to collect. In the event that the primary beneficiary dies prior to the insured, the proceeds are paid to the secondary beneficiary. A doctor; such as a family practitioner, internist or pediatrician, who coordinates the overall care of patients who belong to an HMO or other managed care plan. A type of annuity contract between the annuitant and someone other than an entity that is regularly engaged in the business of issuing annuities. The primary purpose of a private annuity is to reduce estate taxes by eliminating assets from the estate of an individual during his or her lifetime. This is usually accomplished when an elderly family member transfers assets to a younger family member who makes an unsecured promise to pay a lifetime annuity to the transferor. An Internal Revenue Service ruling rendered in response to a request for interpretation of a tax law relative to a specific situation or question. The process whereby the will of a deceased is tested for validity in a court. This can be a time consuming and expensive process that can be reduced or eliminated through proper estate planning. RHU - Registered Health Underwriter. A group of professional independent agents of both stock and mutual insurance companies who provide their collective views on insurance legislation affecting both local and national issues. A formal written document that provides a business plan and objective for a proposed business or investment opportunity, or historical information concerning an existing entity. This information is required in mutual fund, limited partnership and public offering investments to enable investors to make an informed decision before committing resources. This is the person that is named on an insurance application as the individual who is to be covered by the policy if the application is approved. In health insurance, it refers to an eligible doctor, specialist, hospital, laboratory or other health professional (such as a chiropractor) or facility that provides health care services. Person authorized to act on behalf of another individual. Shareholders of a corporation grant authorization through a proxy to vote on specific matters and resolutions at corporate meetings. The government table that is used in determining the economic benefit (taxable amount) provided to an employee for the death benefit provided under a qualified pension plan or a split dollar plan. 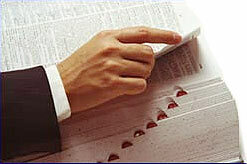 The Revenue Rulings allow the alternate use of the insurer's published term insurance rates to be used. Generally, these rates are lower then the PS 58 rates and result in a lower tax. For joint-life policies Table 38 values are used. The payment to a plaintiff for damages caused by gross negligence by a defendant that exceeds the economic losses and general damages. A dividend option that uses the policy dividend to purchase paid-up coverage on the life of the insured. The amount of the additional coverage will depend on the amount of the dividend and the age of the insured. A type of option that enables the investor to sell a fixed number of shares at a set price within a given time period. This is used as a hedge or protection for an existing investment. An individual who sells put options for a fee or premium. The writer of a put option is then obligated to purchase the underlying security at a predetermined price by a particular date should the option be exercised.